The weather is warming up, and that means it’s time to get out there and eat good food! It’s great to experiment with tasty new foods, but it can be intimidating to order off a menu when you don’t know what something is. That’s why we’ve picked out the best 12 Middle Eastern foods to try this summer. This is a very simple food – it’s meat that is cooked on a spit over a long period of time. That means the meat is juicy, tender and full of flavour. Try it at Zaitoune: Grab a lamb or chicken shawarma wrap at lunchtime, or sit down to enjoy a chicken or lamb shawarma platter with friends. Falafel is a patty made out of chickpeas, fava beans and some delicious herbs and spices. These are then fried until crispy on the outside and fluffy on the inside. 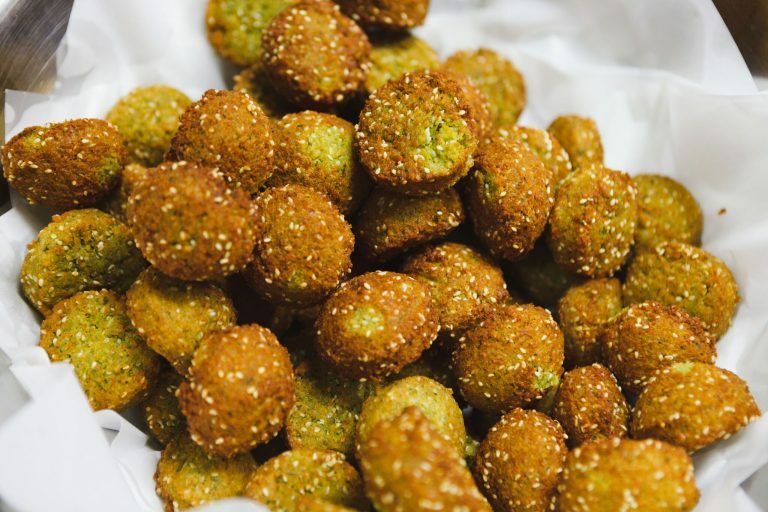 If you’re looking for a vegetarian source of protein, falafel is a perfect pick. Try it at Zaitoune: Grab a falafel wrap for your lunch, or enjoy a Vegetarian Mixed Plate. You can even order a side of falafel to add to your favourite meal! Tahini is a simple paste made out of sesame seeds. Although it doesn’t sound appealing on its own, it’s a foundational ingredient for many tasty Middle Eastern dishes. It’s also a great source of plant-based calcium. Try it at Zaitoune: We use tahini in our hummus, Baba Ghanoush and Samkeh Harra, as well as an ingredient in some of our wrap sauces. Check our menu for even more tahini options! Hummus, or hommus, is a dip made out of chickpeas, olive oil, tahini, garlic and lemon juice. It’s perfect for dipping bread, flatbread or even meats into. Hummus is also very popular with little ones, so share it around the family! Try it at Zaitoune: Grab hummus with pine nuts, spicy meat or both as side option. If you’re with friends, why not get a sampler dip plate to share? This delicious dish is made using char-grilled eggplant, tahini, olive oil, lemon juice and garlic. The smoky flavour is truly unique, and makes it a crowd-pleaser. Perfect for dipping bread, vegetables and meats. Try it at Zaitoune: Order it as a side, on the Vegetarian Mixed Plate or served with the chicken and chicken & lamb Feast Boards. This simple salad is not to be missed. Made with tomatoes, parsley, mint, bulgur and onion, it’s seasoned to perfection using olive oil, lemon juice and salt. The fresh minty taste will revitalise your palate. Try it at Zaitoune: Enjoy it as a side, or try it with our half-metre and metre Feast Boards to share with loved ones. Kafta takes meat to the next level. Using a combination of Middle Eastern spices, lamb or beef is flavoured to perfection and cooked until juicy. It can be served on a skewer, or as a meatball. At Zaitoune, we pride ourselves on our lamb kafta. Try it at Zaitoune: Grab a wrap at lunchtime, or enjoy with our Mashawi and Skewer plates at the dinner table. This traditional Arab dish is made used lamb, yoghurt and spices. It is slow-cooked, and then served with rice or bulgur. It is the national dish of Jordan, so you know it’s tasty! Try it at Zaitoune: Enjoy a lamb mansaf, or try a chicken mansaf if you want a twist on the traditional dish. Muhammara is a tasty pepper dip. It’s made using Aleppo peppers, walnuts, breadcrumbs, pomegranate molasses and a blend of herbs and spices. If you like spicy capsicum dip, this is the original. 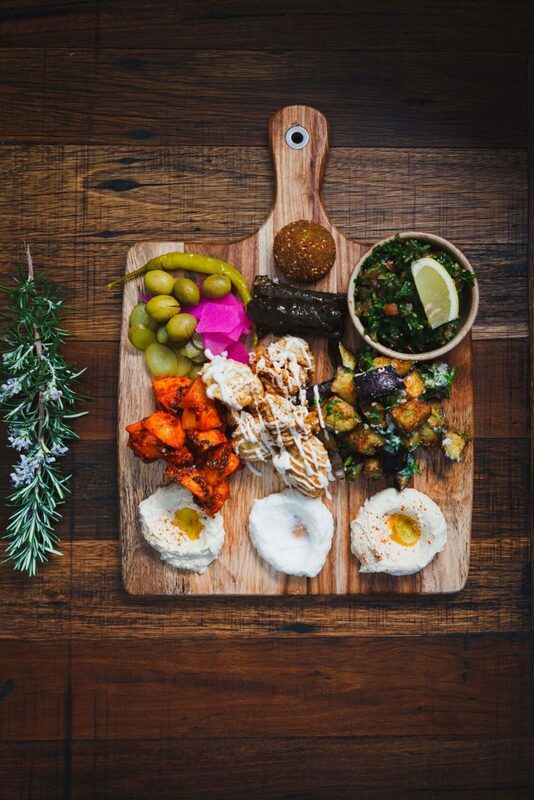 Try it at Zaitoune: Order as a side, grab a Vegetarian Mixed Plate, or enjoy it with your metre or half-metre Feast Board. This is a Lebanese-style dish that uses white fish. It’s prepared with a tasty tahini sauce, and then served on a bed of rice. In Arabic, ‘Samkeh Harra’ means spicy fish. Try it at Zaitoune: Find our Samkeh Harra option on the main menu, made using sustainable NZ Hoki fillets. This tasty salad is made using flatbread and garden vegetables, and is dressed with a combination of garlic, pomegranate molasses, lemon juice and olive oil. The flatbread is nice and crispy, so you get plenty of crunch with every mouthful. Try it at Zaitoune: Order fatoush as a side, or try it from one of our half-metre or metre Feast Boards. Kibbi is a tasty little ball of mince, spices and bulgur. There are many different types of kibbi depending on the origin of the recipe and what ingredients are used. At Zaitoune, we use lamb mince and pine nuts, and serve them with yoghurt. Try it at Zaitoune: Grab a side of kibbi, or share a metre Feast Board with friends or family. 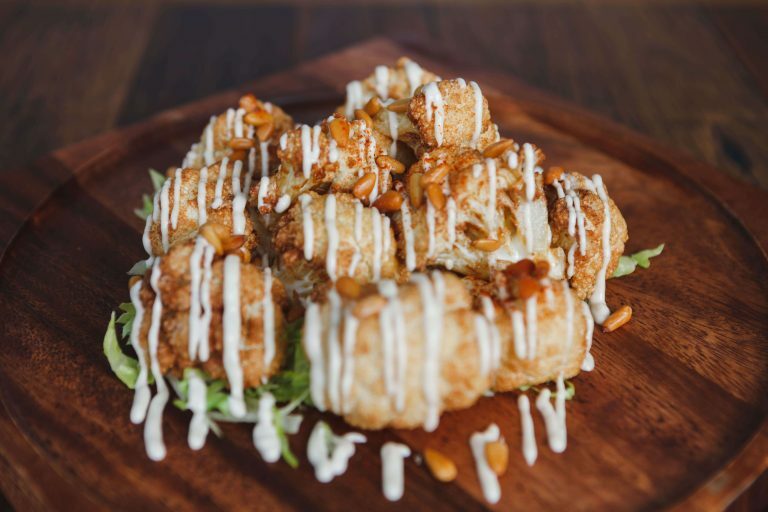 Are you ready to try some of these delicious dishes? Make sure you pop over and book yourself a table at Zaitoune today! Work Christmas Parties: How To Make Sure Yours Is Amazing! It’s that time of year where managers remember that Christmas is right around the corner! But don’t worry. If that’s you, we have the tips that will make sure your work Christmas party is a raging success. There’s nothing worse than trying to find a venue by November. If you’re smart, you’ll book a venue today. This means you secure your spot at a great venue, and can get people thinking early about keeping the date free. It’s also a great motivational factor for your workplace. Workers always love chatting about what they’ll wear and how much fun it’s going to be. So if your workplace is feeling the end of year crunch, let your workers know that their end of year reward is already booked. You might have your favourite restaurant. But how terrible would it be if you found out that they don’t allow large group bookings? That’s why it’s important to find somewhere that caters for bigger functions. First, you need to know your potential number of attendees. Start with the total number of employees at your workplace. Then consider whether you will also have plus ones. Assume that everyone will be coming – this way, you avoid underestimating your number. If you have more than about a dozen employees, running a function can be difficult. That’s where it’s best to find a venue that has function coordinators available to help you plan your event. Weather can also play a role in where your function is held. Sure, if it’s December, it should be nice. But Sydney weather can be unpredictable at the best of times! So you want a venue that has undercover areas and air-conditioning available. Comfortable guests are happy guests – no one likes sweat patches or wet feet. In Sydney, food is everything! We like our good food, and no event is complete without it. So make sure that you know how to keep your guests well-fed. Ideally, you’ll find a venue that includes delicious food to offer at your work Christmas party. Venues that are used to catering to groups are a great choice, as they can produce finger food or sit-down meals, depending on your needs. How do you know what type of food to serve? It depends on a few factors. If you have a big group, finger food options are more affordable and allow for more socialising. If your team is on the smaller side, a sit-down meal might be more suitable. Remember, whether you self-cater or use in-house catering, you need to make sure there’s something for everyone. Ask your attendees in advance if there are dietary requirements. Guests feel good when they know that their needs are covered. You might need to offer gluten-free, dairy-free, vegetarian and/or vegan options. If you use in-house catering, simply pass these requirements onto the venue team in advance. Do you know whether you want a dry event, an open bar, or a BYO? Whichever way you go, you need to know that the venue is suitable for your needs. If you are including alcohol in your work Christmas party, security may become a consideration. This is something to bring up with the venue function coordinator if available. If not, you may need to bring in a security guard or two for the event. They will make sure everyone stays safe and leaves safely. If you decide to keep the experience alcohol-free, make sure this is clearly communicated to guests. Then ensure that there are plenty of delicious alcohol-free drink options. The real ‘blah’ work Christmas parties are the parties that just mish-mash things together. If the food’s average, the venue is ok and the tunes are half-hearted, your guests will be yawning. Instead, you want to make the event a real experience. That’s where a venue function coordinator really shines. A comfortable, inviting area needs to be blended with quality food, appropriate music and professional, friendly venue staff. Your guests want time to socialise, but also an opportunity to sit and enjoy. Add in a couple of giveaways, awards or fun competitions, and you have a winning formula for a great work Christmas party. So have a look at your plans for the event. Are you going through the motions – or are you creating a truly enjoyable experience? Do You Need To Throw An Amazing Work Christmas Party? At Zaitoune, we have everything you need to have a great work function at any time of year! Our venue function coordinators can answer any questions you have about your special occasion. We serve delicious Mediterranean and Lebanese food that is sure to be a crowd-pleaser. Our menus can be customised to suit your needs. We can also offer food that suits many dietary requirements upon request. Our restaurant is well-known for its successful functions. We’re able to cater for large events with up to 100 function guests, but small functions are also more than welcome. No matter what drinks options you want for your event, we can help. Zaitoune serves alcohol within the restaurant. We can also accommodate BYO or arrange for tasty non-alcoholic beverages like our frappes, milkshakes and rosewater lemonade. Most importantly, our Zaitoune family wants your function to be a success! So our staff will be on hand ready to help you have an amazing time. Ready to book your work Christmas party at Zaitoune? Simply fill in our easy function form, and we’ll be in touch to organise your event. https://zaitoune.com.au/wp-content/uploads/2018/06/Work-Christmas-Parties-How-To-Make-Sure-Yours-Is-Amazing.jpg 600 1000 Zaitoune http://zaitoune.wkdigital.com.au/wp-content/uploads/2018/05/logo.png Zaitoune2017-09-27 03:11:582018-06-13 03:13:23Work Christmas Parties: How To Make Sure Yours Is Amazing! Eating out as a vegetarian can be challenging at times. Even if you manage to find a single vegetarian dish, they’re often bland and boring. But at Zaitoune, we’ve got you covered. From flavour-packed mains and salads to sides and dips, there’s something that everyone can enjoy. Today, we share our favourite vegetarian dishes for every occasion and appetite. All our vegetables are sourced locally, and everything is made in house. The vine leaves are wrapped by our mum from fresh leaves, that are sourced from her own and relatives grape vine’s cooked in fresh Tomato water and lemon juice. Our delicious meals are an experience not to forget. A mixed plate designed for you, what more could you ask for? This plate incorporates all of our best options for a vegetarian meal. You’ll love the dip options – both creamy hummus and baba ghanoush, plus a spicy muhammara to fire up your taste buds. The warm spicy falafel and tangy vine leaves will fill you up, while still being light. Add some lightly fried cauliflower and eggplant, and you’ve got the perfect mix of vegetarian options. The ultimate in vegetarian dining – a half-metre mezza board of deliciousness! If you can’t pick which dish to try, this is the choice for you. It’s got plenty of dips, sides and salad options for you to enjoy. Every single one is packed full of flavour, so you can’t go wrong. Remember, you need at least 2 people for a mezza board – you can’t keep all of that goodness to yourself! So bring along a veggie-loving friend to share with. When it comes to crafting the perfect eggplant dish, it’s all about the preparation. We lightly fry ours, so that it’s never soggy. Then we serve it with a light and creamy yoghurt, cucumber and mint sauce that gives a fresh taste. The end result is our delicious batinjan. Pair it with your favourite salad, or enjoy it solo – the choice is yours. You don’t get more traditional than stuffed vine leaves. We pack ours full of rice, tomato, onion, parsley and a blend of spices that will have your mouth watering. They are then gently cooked in an olive oil and lemon sauce to bring out the flavour. Perfect for when you want a light meal, or paired with some of our salads and dips. Everyone loves potatoes, but we think you’ll love ours even more. We hand cut our potatoes, and then cook them to perfection. Mixed with garlic and coriander, they are far more flavoursome and delicious than your average potato dish. Even the most dedicated carnivores will be asking for more! No one likes a boring salad. That’s why we’ve created a combination of tasty ingredients that your taste-buds will love. First we grill halloumi to perfection, so that it’s crispy on the outside and gooey on the inside. Then we place it on top of a bed of rocket, lettuce, tomato, cucumber and onion. We finish it off by drizzling it with a sweet pomegranate molasses and olive oil dressing. This salad is a must-try for every cheese fan out there – the ideal mix of salty, fresh and sweet in every mouthful. 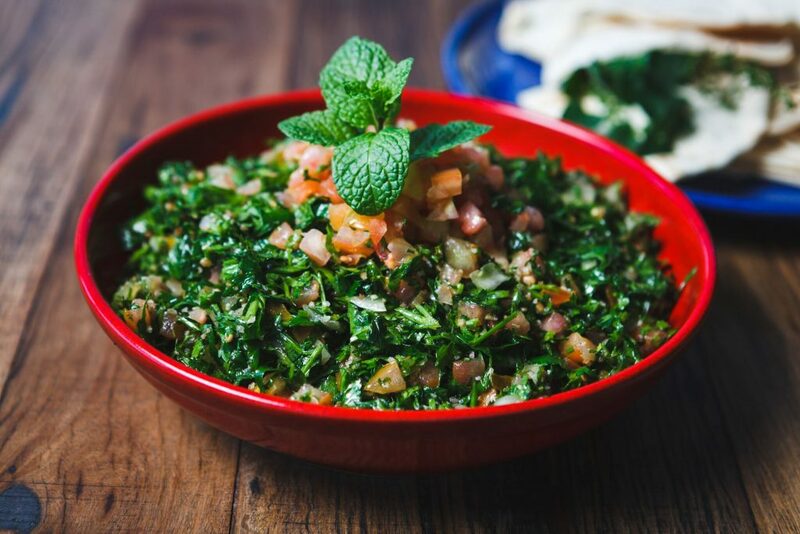 For a traditional Middle-Eastern salad, you have to pick our fabulous fatoush. This bread salad is a must-try for anyone who wants a tasty cultural experience. We make this salad with a traditional Levantine pita bread. We toss crunchy pieces of pita with tomato, cucumber, radish, onion, cabbage and parsley. Then we dress it with garlic, pomegranate molasses, lemon juice and olive oil. This creates a delicious mix of fresh flavours and textures that will keep your tastebuds tingling. At your request, we can make this salad gluten-free, so don’t feel like you have to miss out if you can’t have gluten! If you haven’t had hummus before – it’s time to change that. This classic chickpea-based dip is everyone’s favourite! We make our traditional-style chickpea dip with tahini, garlic, lemon juice and olive oil. Then for a crunchy finish, we top it with roasted pine nuts. Whether you enjoy it with crispy pita bread, scooped over a salad or spread over eggplant slices, it’s fresh and delicious. In fact, it’s so good, you might even just eat it with a spoon – don’t worry, we won’t judge you. If you like to live on the spicier side of life, muhammara is the dip for you. We’ve perfected this Aleppo pepper based dip – you won’t find better. With ground walnuts, breadcrumbs, pomegranate molasses, herbs and spices mixed together with the spicy peppers, it makes a rich, flavour-packed dip. We drizzle it with olive oil right before serving. If you’re not a fan of hot spices, don’t be shy – this pepper only has a moderate heat that builds gradually, so you get that warm glow after every taste. Which dish do you love the sound of most? Share with us below. Can’t wait to get your hands on delicious vegetarian food? Book a table today! You’ve heard it right…!! Come and enjoy Authentic Lebanese Food cooked with fresh local and seasonal products and also some of which is grown in our own productive Vegetable garden at Zaitoune from 11:30am to 3:30pm (Lunch Hours). We are offering 10% Discount on our Eat-in Menu on all items except for Mezza Boards. This Promotion is available from today until unless otherwise stated. Have you and your friends and family tried Zaitoune Restaurant in Putney, Sydney? Zaitoune is now offering Shisha Sunday evenings to Thursday evenings every week. Shisha is the perfect way to relax after a hard day at work and perfect for enjoying some quality time with your friends and family. Shisha is known all around the world by many different names such as water pipe, Hookah and okka. Shisha or a Hookah is an old delicacy from the sub-continent. It became popular around the 15th century, when Indian glass makers began to export their goods to the West with the help of the East India Company. The base of the Hookah is called a Shisha and soon it became quite popular even among the British elite. Shisha was extremely popular among the monarchy, especially the Mughals and the Ottoman kings and tobacco became a stable drug which people smoked in Shisha. Shisha like scotch or brandy was considered an after dinner treat among the royals. It is still very popular in the Middle East and South-East Asia today. The traditional Hookahs or Shishas were beautifully designed and sometimes even hand painted and crafted with bold, vibrant colors. Unlike in the West where Shisha is only served in bars and cafes, in the Middle East, India and Pakistan it is far more common especially in the rural areas and among the labor class. Egypt is one of the most famous places where Hookah is quite popular and both men and women all around the World, especially the Middle East enjoy the water pipe. Surprisingly in cultures where smoking is not seen as a feminine act and less tolerance is shown to women who smoke, Shisha or Hookah does not have the same taboo or generate the same response. Hence Shisha to this day still loosely fits in the social norms of the society. Shisha comes in many different types of flavors including a variety of tobacco flavors which are most commonly used. Flavors such as fruity, minty, rich and creamy etc. are widely available in the market and many people now prepare their own Shisha’s at home. At Zaitoune we offer many flavors that would satisfy your taste buds and leave you craving for more. We offer Shisha from Sunday evening to Thursday evenings to make your hangouts interesting and fun. Check out our website or come visit us at Zaitoune and enjoy the water pipe in its various flavors surrounded by some soothing music and excellent ambiance. And of course, don’t forget our stunning cuisine!